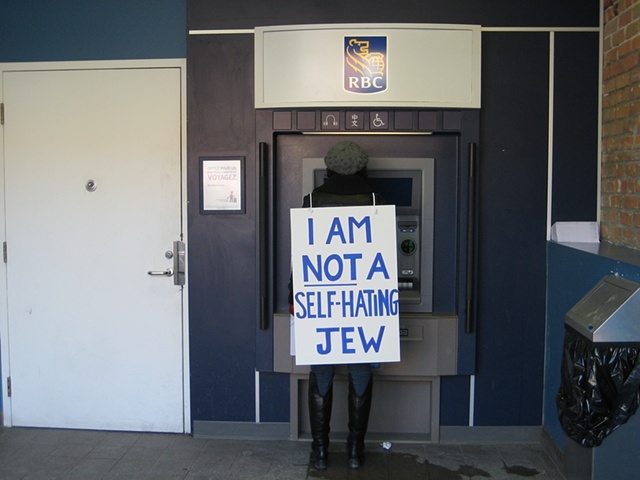 For one afternoon I wore a sign that read, "I am not a self-hating Jew" as I went about my daily activities in my ethnically mixed, bilingual (French-English) neighborhood  here at the ATM. The performance explored what it means to be Jewish and speak out against the actions of the Israeli government  a stance that often leads to accusations of being a "self-hating Jew" by mainstream Jewish leaders. This approach is used as a silencing device, to stifle discussion about the treatment of Palestinians. Performed during a time of increasing censorship of those who protest the actions of the Israeli government against Palestinians, this work reflects a belief in the need for dialogue about the Israeli-Palestinian conflict and political conflicts more generally.